Humanitarian aid agencies are struggling to feed, clothe, and shelter Syrians who are fleeing to neighboring countries daily, escaping the conflict in their homeland. Sybella Wilkes of the UN High Commission for Refugees said yesterday, “The lack of funds are very worrying.” The UN has issued an appeal for US $1 billion to provide relief for hundreds of thousands of Syrians. Only a fraction of the funding has come in from donor governments. 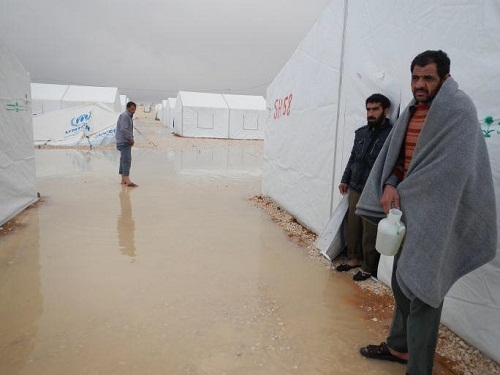 WFP said today that at the Al Za’atri camp in Jordan heavy rains, sleet and snow damaged tents and displaced families. Save the Children staff were also injured when upset refugees entered a WFP food distribution site. The incident occurred when someone tried to use two ration cards. WFP also reports that despite the difficult conditions, general food distributions in January were able to start. The food voucher program, however, was delayed temporarily due to the harsh weather because people could not travel to the markets. From January 2-8 over 6,200 welcome meals were provided to new arrivals at the Al Za’atri camp. Meanwhile, in Lebanon there are now over 192,000 Syrians who have sought refuge. Poor weather also has caused delays there in the relief program. Relief programs for Syrian refugees are also ongoing in Turkey, Iraq, and Egypt. As long as the conflict continues in Syria, humanitarian needs will continue to grow. WFP is making plans to potentially feed as many as 750,000 Syrian refugees. Inside Syria WFP is feeding around 1.5 million people impacted by the fighting. Time is running out for many Syrians as the harsh winter weather takes hold. Article first published as Harsh Weather, Low Funding New Threats to Syrian Refugees on Blogcritics.